I got the amazing opportunity to see an early preview of Pacific Rim: Uprising on Tuesday. My reaction? Well, that certainly was a movie. It was strangely trying to be two movies at the same time: an Ender’s Game ripoff and a Transformers ripoff. Well, and a Pacific Rim 1 ripoff, I guess. It wasn’t bad, but it certainly wasn’t great. Fun way to kill a couple hours. Still, the music was iconic; the computer animation was slick and smooth; the giant robot fights were exciting enough (though they somehow managed to be both too fast and too slow at the same time, and there paradoxically weren’t enough of them). The existing worldbuilding from the first film was really enthralling, though I’m pretty sure most of that can be credited to Guillermo del Toro. Cailee Spaeny’s acting was really good, as was Jing Tian’s, Rinko Kikuchi’s, and Charlie Day’s for most of the film. The ideas were great, and the conflict was at least interesting. All that said, the plot was thinner than thin, and had clunky cliched dialogue, weird contrivances, and unearned victories (and defeats). It was trying to be too many things at once. And as well as most of the acting was, Burn Gorman and John Boyega play weird pastiches of their past performances. Not poorly, just strangely. And the lack of Idris Elba or Ron Perlman was conspicuous. All in all, it was fun, but it tried too hard to be something it isn’t. It’s dumb fun, but not executed as well as Jumanji: Welcome to the Jungle. Still, there’s an awesome idea in there somewhere. Hopefully it can come out in the inevitable third film. The “dumb-fun adventure” genre seems like a tough nut to crack. You’ve got to keep it light and fluffy enough that the audience doesn’t have to think too hard (or even be present for the entire film) to get the plot and be engaged, but you also have to make the characters engaging enough that we like them and care about their survival – and just dangerous enough that it isn’t pointless. When it works, it’s a thankless task that will be panned by “serious critics,” and even the teeming masses who enjoyed it will forget all about it a few days later. Of course, you’ve got your paycheck to fall back on. Still, “dumb-fun” films are often the most difficult for me to hang a Culture-Redeeming hat on. They’re not explicitly trying to make a philosophical point, and they’re certainly not trying to make a theological one; they’re just trying to be fun enough that you won’t demand a refund from the theater manager halfway through the film. The difference I’ve seen between “smarter” and “dumb-fun” action movies, beyond the obvious, is that the smarter films are entertaining while the dumber ones are amusing. It’s a fine distinction, but an important one: entertainment comes from the Latin words meaning “hold together,” and even has the modern connotation of welcoming someone in to have a conversation and discussion together. I see “entertainment” as a discussion of ideas between the creator and the audience, both holding them together in some form. Its inverse, amusement, comes from the Latin words meaning “to not ponder or look closely,” via the early-modern English definition meaning “divert from serious business” or even “delude.” We most often hear the word in context of amusement parks, which don’t require much thought to use correctly. I see “amusement” as a story told purely to divert. And there’s nothing wrong with telling stories of either type; but I think it’s the responsibility of the discerning Culture Redeemer to entertain fiction, not simply be amused by it. Even when there isn’t much there. 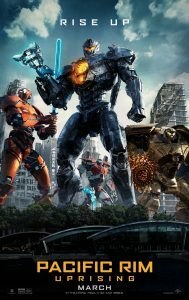 Not that Pacific Rim: Uprising is devoid of ideas. There’s a significant theme of identity running through the film, as both Jake and Amara seek an identity that goes beyond where they started. The film doesn’t explore the theme very much, so we’re left to wonder at their thoughts and motivations a lot. The film also explores the concepts and ideas that make a hero, specifically with regard to Jake trying to discover what made his dad one. Betrayal, the invasion of the outsider, and the the idea of salvation from above also make an appearance. But I think, as with a lot of “amusing” films, the truly interesting conversation is a meta-conversation about the movie, not about the story within it. In this case- why is it so easy to forget this kind of movie? One of the key tenets of this site is that culture can be redeemed because it’s resonating with the story God put on our hearts; and I think the films we consider the most forgettable echo God’s story the weakest. Since it’s resonating so softly, it doesn’t grab onto or hold fast to our hearts; which means we have to try harder to hear its sound. This entry was posted in Sci-Fi and tagged ★★½, amusement vs. entertainment, dumb fun, Pacific Rim, Pacific Rim: Uprising, spoiler-free. Bookmark the permalink.